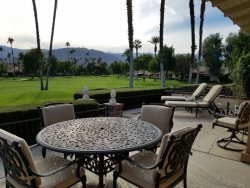 Beautifull 3 Bedroom, 2.5 Bath Rancho Mirage Private Home With Pool and Spal! This exquisite 3 bedroom, 2.5 bath home is decorated with dark wood floors and furniture that captures old world elegance. The living room with the built in fireplace, expansive sectional sofa and flat screen TV provides a centralized entertainment center. The formal dining room seats 6 and is conveniently located near the expansive, well supplied kitchen. With granite counter tops, custom cabinetry and a cooking island that accommodates bar stools, the kitchen provides ample space for cooking and socializing as the heart of the house. A powder room is located off of the kitchen. The master bedroom has a queen size bed, flat screen TV and an en-suite with dual sinks, sunken tub and walk in shower. The 2nd and 3rd bedroom also have queen size beds and one of the guest bedrooms has a flat screen TV. The landscaped backyard is a private mecca with chlorine pool and spa. A lovely private courtyard with seating is located along the side of the house. Wireless connection is offered as well as free local and long distance U.S. and Canada calling. Owner may consider a small dog, with pet fee. Must inquire before booking for preapproval from owner. Owner may consider a small dog, with pet fee. Must inquire before booking for preapproval from owner.